At least 18 people have been killed in a confrontation between security forces and illegal miners in eastern Venezuela. The mineral-rich region sees frequent clashes between rival gangs seeking to control gold deposits. The skirmish broke out when government soldiers raided an illegal gold mine in the town of Guasipati in eastern Bolivar state, local media reported Sunday. Venezuelan authorities have not released details of the operation, but an unofficial military report quoted by Agence France Presse said “an exchange of shots with several still-unidentified suspects left 18 dead,” including a woman. No soldiers were believed to be among the dead. The army seized four assault rifles, seven pistols, three revolvers, a shotgun and two grenades, local newspaper Correo del Caroni reported. It added that the deceased woman was believed to be the sister of alleged gang leader Anderson Rodriguez Cuevas. She reportedly took over running the illegal Guasipati mine after her brother’s murder in September. 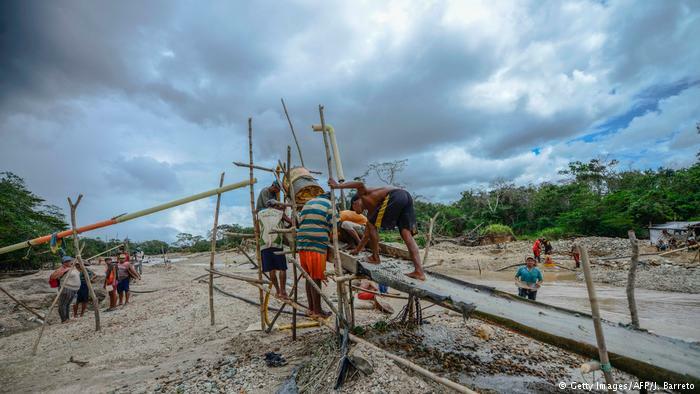 The severe economic crisis gripping Venezuela has driven hundreds of diggers to set up illegal gold mining operations in the Orinoco Mining Arc, an area that stretches from the border with Guyana in the east to Colombia’s frontier in the west. The region has vast deposits of gold, iron, diamonds, bauxite and other minerals. The involvement of armed groups in makeshift mining means clashes over these valuable resources have become fairly common. In 2016, 17 people were killed in nearby Tumeremo in fighting between rival gangs. Their bodies were later found in a mass grave. The town was also the scene of a skirmish between soldiers and miners last September in which 11 people died. The cash-strapped government of President Nicolas Maduro has sought boost the extraction of minerals in the Mining Arc in aneffort to offset falling oil revenues, while at the same time launching a crackdown against illegal mining. “Did 18 citizens die and not a single soldier was injured?” he asked. Local NGO the Venezuelan Program and Education Action in Human Rights (PROVEA) said on Twitter that the operation was concerning because it appeared to share similarities with a 2006 incident in which the military allegedly gunned down several miners in La Paragua, also in Bolivar state.